Ideally suited to fixed water tanks, the Kenders tank gauges are a simple, yet very effective method of checking the level of water in storage tanks. 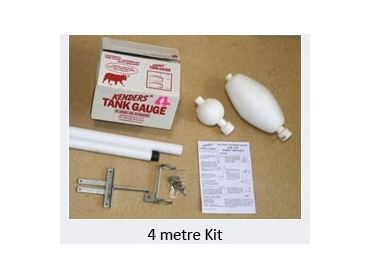 The Kenders tank gauges have been sold throughout Australia after they were invented to suit specific farming needs. With a 32 mm diameter, these tank gauges feature a two-piece galvanized steel bracket that holds the tubing in vertical position. Two x 150 mm high density polystyrene floats are used, one for buoyancy and one as the sighter. 4-metre tank gauges are also available, consisting of 2 x 2 metre UV stabilized industrial PVC poles, one fitted with an internal joiner, one high-density 150 mm ‘football’ float used for buoyancy, and a 100 mm float for the sighter. The two-piece galvanized steel bracket holds the tubing in the vertical position. Both the 2-metre and the 4-metre gauges come with a stainless steel bolt and nut kit. I have a 3500 litre oval water tank around 500 m from my house. It is at least 3 m high. I saw your product, although I would have been more interested in seeing a photo of how it looks erected. Would I be able to read the level of the tank from 500 m away? How much does it cost?